The snow wasn't the best when we went. It was okay, but we had been spoiled by our previous ski trip in 2011 to Saalbach-Hinterglemm when it snowed the entire five days we were there. I believe over two feet of snow dumped on us during that time. It took us about two hours to get the snow off the car and the surrounding area so we could leave! You can read all about it here. Sölden had a decent base but it was barely covering the ground. On the last day we were there it had snowed the night before and was snowing that day too, so at least we had one really good ski day. Then of course the next day when we were taking off the storm had cleared and it was blue skies and fresh snow everywhere. We're not very cheap when we go on our ski trips. 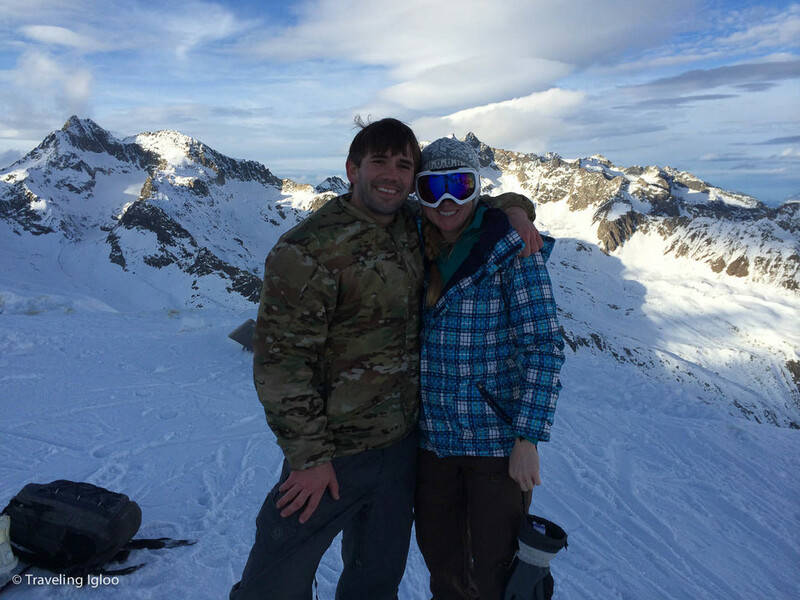 We rented an apartment so we could make our own breakfast and save on drinks, but once we were done skiing for the day we'd usually end up heading to an apres ski bar or grabbing something to eat while we were out. This adds up quickly so if you're trying to save I recommend packing lunches and trying to stay at an apartment or at a place with a kitchen if possible. We also didn't bring our dog this time which was a huge plus. I wish we could bring her everywhere, but she has so much energy that it's better if she stays back with someone that can take her out and play as often as she needs. That dog is crazy. We visited Marco's apres ski a few times. It's right off the main street and you can't miss it. These ski towns are a bit expensive when it comes to food and especially drinks. In Germany if you order a glass of wine you get a glass filled nearly to the brim with wine. In Austria they fill it exactly to the line on the glass (so about half of what you'd get in Germany). The same goes for beer. In Germany for about 3 Euro you can get a .5 liter glass of good German beer. In Austria for 3-5 Euro you get .33 liters of highly carbonated Stiegl or occasionally a decent German beer. Dining out is about the same as anywhere else in Germany, but it may be just a tad more expensive. Pizza and doner kebabs are the cheapest fare, but there are also upscale dining options too. The lift tickets were around 50 Euro before 11am, then 45 Euro after 11am, and they would continue to drop like this throughout the day. When we were in Saalbach a day ticket was 35 Euro. While none of these prices are terribly high (especially when you consider how much a lift ticket is in Vail or Breckenridge or Heavenly), 50 Euro was more than I wanted to spend each day. They did have multi-day tickets as well which saved a few bucks, but I was surprised that the lift tickets weren't a bit cheaper. Guess I should've checked the website more before I left. After skiing is over for the day, those looking to quench their thirst can head over to one of the many apres ski bars located both on and off the mountains. Popular drinks in Austrian ski towns include the flying hirsch which is a jager shot in a small glass container that's dropped into red bull. Gluhwein (hot mulled sweet wine) and beer are also popular among travelers. Another drink you'll find at most apres ski bars is jagertee (don't worry there's no jager in it!) which is similar to hot gluhwein but with tea and brandy added to it. 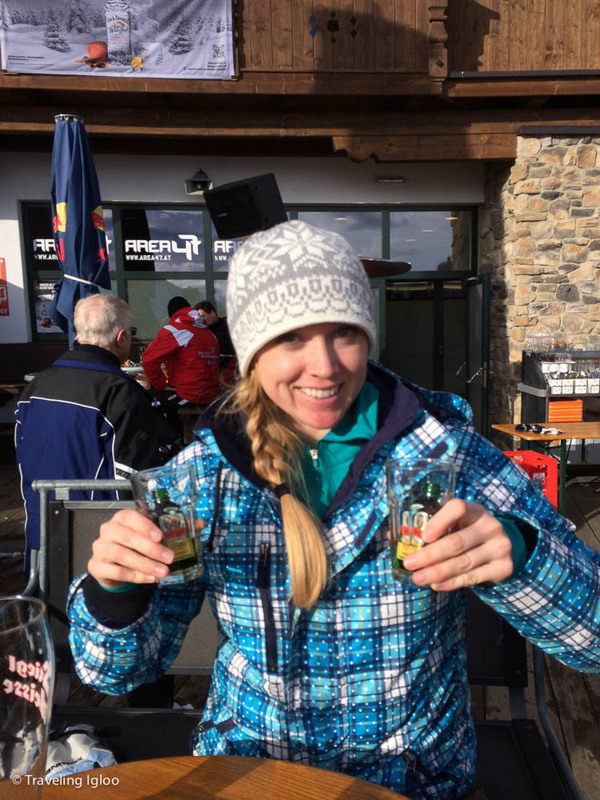 If you're on the mountain, the apres ski starts early and oftentimes you'll see people having a drink well before noon, possibly to aid in relieving the effects from the night before. Marco's Apres Ski bar is right off of the main street and opens bright and early at 10am as well. The music that's played is generally traditional German and Austrian tunes that are popular at festivals, but you'll also hear techno and house as well. Many apres ski bars are circular establishments with windows covering the perimeter and the bar in the center of everything. Come early if you want to participate in apres ski because these places shut down around 8pm on most nights. After that people pour out of the bars and into the streets, and inevitably off to the next place to have some fun. Prost! Time for a flying hirsch! We checked out many of the apres ski bars on the first night after getting settled into our place. We decided to do our own pub crawl and explore everything. Most of the places are located on the main street but there are a few others as you head across the river too. The Irish pub on the main street was also fun. We met an American from Wyoming who now also lives in Stuttgart and has been here for years. Our server came from Romania and taught us a few things about her home country's history. While I'm not a huge fan of clubs, in the spirit of vacation and checking out new places we went to the ever popular Fire and Ice. I was expecting extravagant prices as it's just about the only dance club in Sölden, but was surprised that there wasn't a cover charge and it was only 1 Euro for a coat check. The drink prices, however, we very expensive. So we danced and we were merry. They even had a show at one point which was quite entertaining. The ski runs were incredibly long, and the queues were fairly short. The longest I think we were in line was for about 5 minutes. Other than the lack of snow, everything about the skiing was fantastic and the views were to die for. Just like other ski towns in Austria, there were a decent variety of restaurants and plenty of places where we could eat. Austrian/German cuisine isn't my first pick so many times we would stop in at an Italian restaurant. One night we ate döner kebabs for dinner to save money and because we were exhausted after skiing all day and just wanted to get back to our apartment. There was a restaurant called Hubertus on the main street that had fantastic food. We ended up eating dinner there two nights in a row because we loved it so much. The prices were a bit higher but we ate delicious tartare, salmon, ox, and duck. Above is käsespätzle, a delicious and very swabian dish. It's spätzle (similar to a noodle) mixed with cheese and topped with fried onions. Watch out mac and cheese! Can you guess what this is?! It's beef tartare, raw beef mixed with herbs and whatnot. Don't knock it until you try it...it's actually delicious. This may not seem like a special photo, but I wanted to point out how small the beers are in Austria (at least compared to Germany). In Germany you get served .5 liters. In Austria it's usually .33. Face Off: Saalbach-Hinterglemm or Sölden? Food: Sölden. 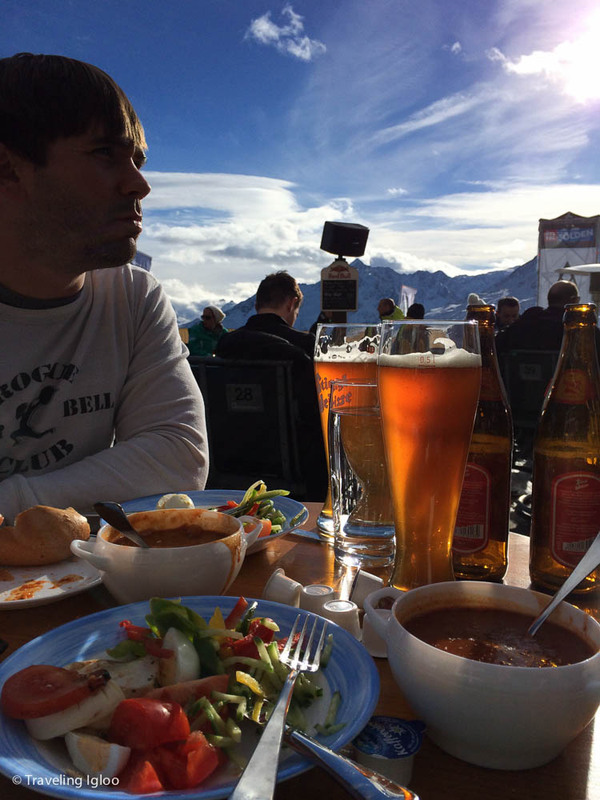 The dining options at Sölden were greater and the food overall was better in my opinion. That being said, I don't think Austrian ski towns have the best food, but German/Austrian fare isn't my first option when I'm out to eat so I am biased. Skiing: Toss up. I can't say one way or another because Sölden didn't have much snow and Saalbach had a ton of it. 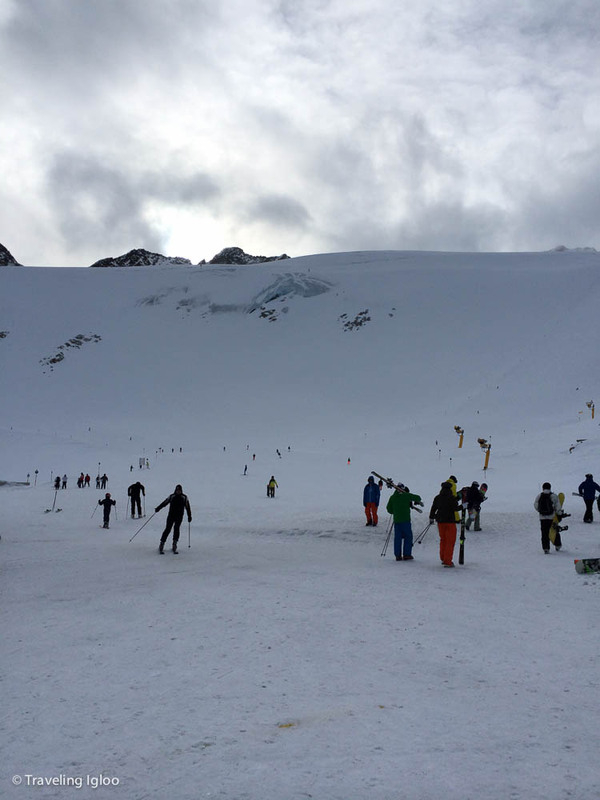 I will say that Sölden has much longer ski runs and many steep ones too. Saalbach had more short runs than long ones but the snow was so good it didn't matter. We also only skied in Saalbach when we visited but there was the option to take a free bus to Hinterglemm nearby. The Ski queues: Saalbach. Saalbach had shorter queues when we went, but in Sölden most people were done by around 12-1pm and after that there were no lines. 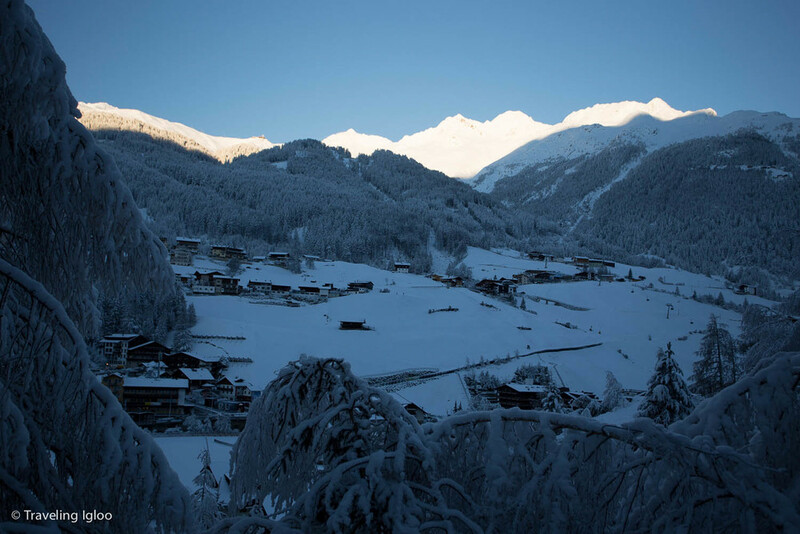 Nightlife: Saalbach-Hinterglemm. I preferred set up in Saalbach better. The main street with all the shops and bars is a pedestrian walkway versus a street where cars are kicking up dirt and snow while you walk by. There was also more variety in terms of places to go and I liked the bars better. They had a few clubs and an overall good mix of different places. Apres Ski: Toss up. I found the apres skiing on the mountain at Sölden to be better, but thought that Saalbach had more lively apres ski bars in the town. The atmosphere at Saalbach was also more fun. I can't describe it, but everyone was in a great mood and were having a great time. I felt like Sölden was more of a family place so maybe that's why the after parties weren't as crazy. We had a great time overall, but found that since we're not die hard skiers a week was too long (and too expensive!) for us. All the lifts were closed on Christmas because of a storm so we didn't go that day, and we missed another day because we wanted to check out the famous Aqua Dome (more about that in another post). I think next time we'll just do a four day trip then go somewhere else afterward. It also felt more like a family ski town and it wasn't as lively as Saalbach so we may search for something a little more upbeat for our next ski adventure.